I often wonder what is at play as I pass my friends on a downhill while drifting compared to them pedaling. Is there an aero loss to the moving legs? Does it boil down to some combination of weight difference, wheels, and aero positioning? Drafting is playing a primary role as you approach and pass them. When you are far behind, this contribution to your speed can be ignored. So if you close in on them from a far distance back, then you really are rolling faster. Assuming you are rolling faster, then the next contributions are your weight and frontal area. If you have more weight and/or less frontal area, you will also run them down. Yes, the relative aerodynamic drag of your wheels vs. theirs will contribute to your speed difference as well. Finally, differences in tire rolling resistance as well as friction in the clicking freehub will contribute. As for you passing pedaling riders while you are coasting, we all know that at a certain point it is faster to coast than to pedal on a fast enough descent. The question is, at what point is that true? Often, the tradeoff in aerodynamics to hold a riding position in which you can pedal costs you more speed than just keeping quiet on the bike and coasting, even though the speed is not so high that you are spun out. This is more obvious if your friend is pedaling in a higher body position than you. In any case, there will be more turbulence around pedaling legs than around ones that are not moving. 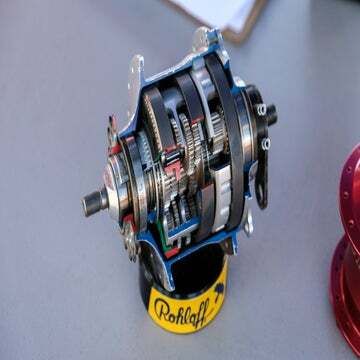 I have a question regarding the new direction of Shimano Synchro shift. The new TT bar setup only has one button on each brake lever and one button on the end of each aero extension. I like riding in the big ring most of the time, up hills included. 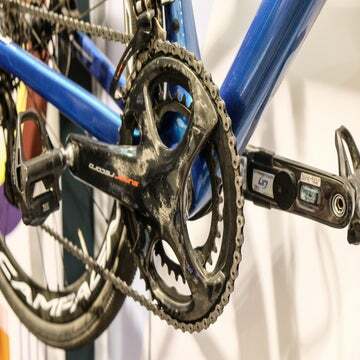 I want to be able to ride in the 53/25 while an 11-28 cassette is installed. 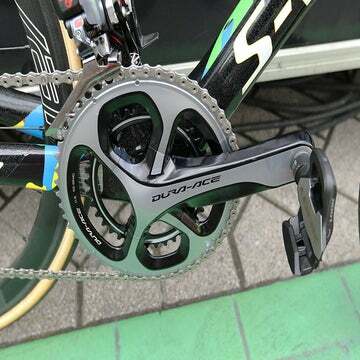 How do I do this with the new Di2 TT setup from Shimano? It seems crazy to me that they have eliminated this option from their setup. There literally isn’t a way to shift the front derailleur at all, which sounds crazy. Clarification is needed here. I think you’re all set going in, with the default setup with, for instance, ST-R9160 Shimano Dura-Ace Di2 TT levers. And if not, you can reprogram it with your phone or PC. The S2 (fully Synchro) mode in the default configuration on Shimano Di2 2 X 11 keeps the chain on the large chainring when shifting down from the smallest cog through the cassette all of the way until the second-to-largest cog. And that would be your 25 on your 11-28 cassette. Only when you ask for one more lower gear will it drop to the inner chainring (while simultaneously shifting up to the fourth largest cog), rather than shifting to the largest cog. You can read more about what I’ve written regarding the use of reprogramming here and here. I recently purchased a deep-dish aero road bike wheel and noticed that its weight is slightly out of balance. Can you tell me how to weight balance a bicycle wheel? With the bike in a stand, let the wheel spin until it stops. If it always stops with the same point at the bottom, then that is the heavy spot (if it is inconsistent, your hub bearings need work). Obviously, drop the chain off of the cogs if it is a rear wheel. You will need to weight the spot on the rim opposite the heavy spot. You can tape small weights to the rim opposite the heavy spot. Often, the heavy spot is opposite the valve stem (i.e., the wheel always stops with the valve and the top), and you can screw more valve collars onto the valve until it no longer favors stopping with the valve at the top. Not all 6-foot-1 guys get to that height the same way, and I get there with shorter femurs and a longer torso. My bike fitter recommends a 78-degree seat tube angle to accommodate the short femurs. I found that STA on the road with an aero frame, grudgingly. Unfortunately, almost all size 58 frames for CX bikes come with 73-degree seat tube angles. Even with a zero-setback seatpost and the seat slammed forward, I can’t quite get the full 78 degrees if the bike’s STA is 73. I compensate with shorter 170mm cranks, but that is not ideal for CX. Maybe I’m not the only one with this problem: I’ve noticed that many pro riders above six feet tall have their seat slammed as far forward as possible (such as Matthieu Van Der Poel), and/or they downsize to a size 56 frame with a longer stem. I’ve tried both and don’t like either option very much for CX, because I’d like flex in the seatpost and a shorter stem. Any recommendations? Being a custom framebuilder, I’ll give you the same answer any custom framebuilder would: get a custom frame! Other than that, your options are a turned-around seatpost like triathletes used to use before tri bikes came with steep seat angles. Perhaps if you were to use a Thomson setback seatpost, which achieves the setback with a bent shaft, you could still get some flex out of the post when you turn it around so it bends forward rather than backward. Obviously, this forward position on the bike requires that your stem be much longer to get your bars out to a comfortable position, especially since you say you have a long torso. A custom frame will be just the ticket for you!